The Plustek PL7500 provides you the fastest and most efficient software for your document management. The PL7500 is a new member of Smart Office series of scanners that offers the high-speed scanning capability and compact design for workgroups and other decentralized scanning applications. The PL7500 is a versatile high-speed scanner for personal or business users looking to increase their efficiency while on a limited budget. It has a built-in Auto Document Feeder (ADF) that holds up to 80 pages at a time while providing a maximum scanning speed of 75 pages per minute, optical resolution up to 600 dpi, and USB 2.0 compatibility. Fully automated buttons on front panel helps you to scan a stack of pictures, file them, save in your preferred format and at the dpi you want. 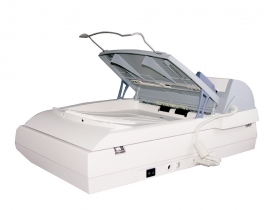 An extension to the popular Smart Office line, the PL7500 breaks the “speed barrier” by delivering up the high speed of self-fed document scanning. With the “Double-Sided” feature, it saves your time to do digital filing and document management and makes all work flow smoothly and easily. Ideal for various business users or the corporate users (hospitals, law firms, CPA firms, banks and other financial institutions), this new document scanner is designed to provide maximum utility with minimum effort.